Is yogurt a way to introduce healthy eating habits in children? How to add yogurt to a kid diet? Milk and dairy products such as cheese and yogurt are nutrient-rich foods and several studies have suggested an inverse correlation between dairy product consumption and BMI. A US study among 5124 children (2-18 years) between 2003 and 2006 shows that the frequent consumption of yogurt may contribute to an improvement of diet quality and insulin profile in children. The frequent consumers (min. one serving per week) have a better diet quality, a lower fasting insulin level, a lower insulin resistance and a higher index of insulin sensitivity compared to the non-frequent users. However, yogurt consumption was not associated with body weight, fasting glucose, serum lipid profiles, C-reactive protein, and blood pressures. Is breakfast a key meal? A recent study shows that children and adolescents who skip breakfast are more likely to be overweight than those in the habit of eating breakfast daily. And a study among 7 116 children (6-18 years) in Turkey examined the association between body mass index (BMI) and lifestyle, including breakfast habits, dairy consumption and physical activity. It shows that only 62.6% eat breakfast every day. Children who are overweight or obese are significantly more likely to skip breakfast than their counterparts of normal weight and One in four overweight or obese children never eat breakfast. Those children who skipped breakfast eat lunch in the form of snacking more often than those who have breakfast every day. However, there are no significant associations between eating lunch and overweight/obesity. Poor nutritional habits and physical inactivity have been blamed for children’s overweight and obesity. Breakfast is considered the most important meal of the day and studies have found that obesity is less common among those who eat breakfast regularly. How much sugar does yogurt bring to kids? Numerous countries consider public health policy measures or regulations to counteract excessive sugar intake, especially in children. A study based on the data from 11 representative European surveys showed indeed a relatively higher total sugars consumption in children (16 to 26 % of total energy intake), than in adults (15 to 21 % of energy). Added sugars also represent a higher intake proportion (11 to 17 %) in children than in adults (7 to 11 %). More than 50% of total sugars in children’s diets come from sweet products (cakes, sweets, etc.) and drinks. 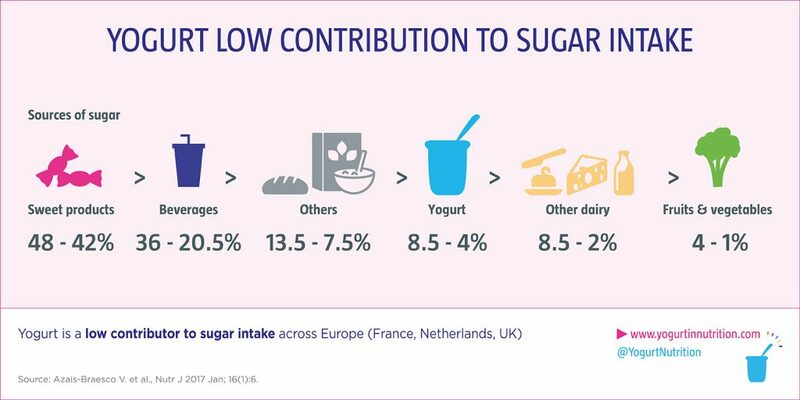 Yogurt accounts for only 1–8% of total sugars intake and 4–9% of added or NME* sugar, depending on country. * Non-milk extrinsic sugars include: table sugar, honey, glucose, fructose and glucose syrups, sugars added to food and sugars in fruit juices. Zhu Y et al. ; European Journal of Nutrition; 2015; 54 (4) : 543-550. Koca T, Akcam M, Serdaroglu F, Dereci S; Breakfast habits, dairy product consumption, physical activity, and their associations with body mass index in children aged 6–18; Eur J Pediatr. 2017. Azaïs-Braesco V et al. Nutrition Journal 2017;16:6.